On the streets of Europe, shop keeps sweep and put out plants as the light of day breaks the horizon. They welcome customers – and another opportunity to be part of a bigger picture. It’s the very thing that local businessman Barry Plunkett says caused him to become the owner of Fondren’s Interiors Market. 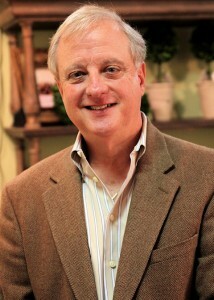 A Fondren resident and Fondren Renaissance Board member, Plunkett became the owner just after the first of the year. There was a chance the business would simply close after 20 plus year owner Linda Shelton decided to move on to another chapter in life. “I couldn’t see that happening”, Plunkett tells us. “It has been such a destination in Fondren for many years”. As a co-owner of an Interiors Market vendor, Belgique, for the last seven years, Plunkett talked with his wife and son who thought he was crazy. “You’re retired”, they told him, but he felt it was the right thing to do after many living room meetings with Shelton. As a lover of European antiques, Plunkett and his wife along with a Millsaps fraternity brother and his wife make trips to Belgium four times a year. “We have a warehouse three miles from here full of pieces”. His line will continue to be represented but new vendors will be added. And current vendors are excited for the change, too. “We met with them and they have a thousand ideas”, he says. And what are the plans for Interiors Market? “Certainly to continue what has worked so well”, Plunkett says: “an eclectic mix of antique, contemporary and gifts. Really anything you could see in a home”. He tells us Market Bites by Bon Ami will continue to be a staple for the shop. “It’s a great little restaurant”. Plunkett will expand a private dining space in the back, making it more suitable to host groups and clubs. “We want a place that becomes a venue for activity and not just a spot to shop”. Diversity in vendors and in activities and events is crucial, Plunkett believes, to make his business – and this neighborhood work. “There’s a sense of family here”, he tells us. Already Fondren Cellars has participated in a promotion with Interiors Market and in April, Treehouse Boutique will be part of a fashion show. “Anything that allows us to work together – we’re going to do it. Even vendors are rearranging and making plans for the future. They have a real sense of ‘we’re all in this together’”.